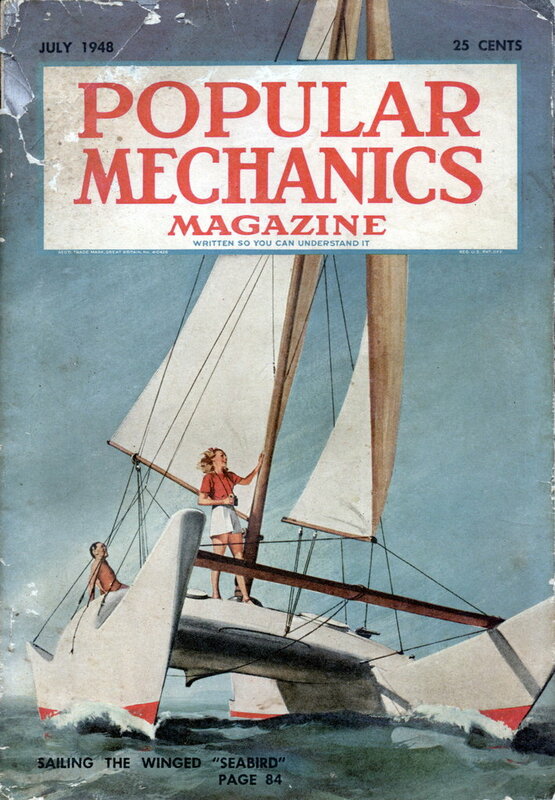 Necessity made the United States a nation of pioneers. Development came to us only by conquering the wilderness. For a hundred and fifty years we have been clearing farms and rearing communities where desolation wasâ€”bridging rivers and making roadsâ€”reaching out, step by step, to civilize three million square miles of country. One of the results has been the scattering of families in many placesâ€”the separation of parents and children, of brother and brother, by great distances. Translation: At Bell Labs even our marketing drones are total geeks. 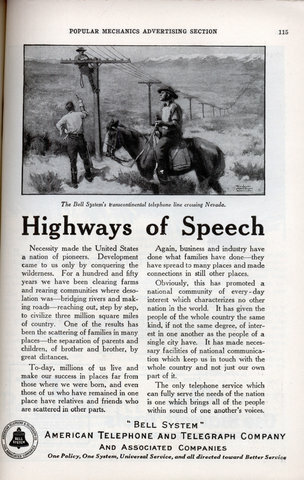 Bell Telephone System serves the American Public. 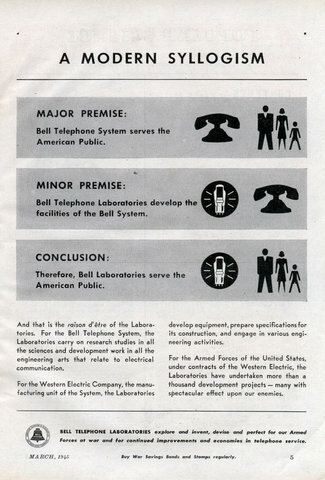 Bell Telephone Laboratories develop the facilities of the Bell System. 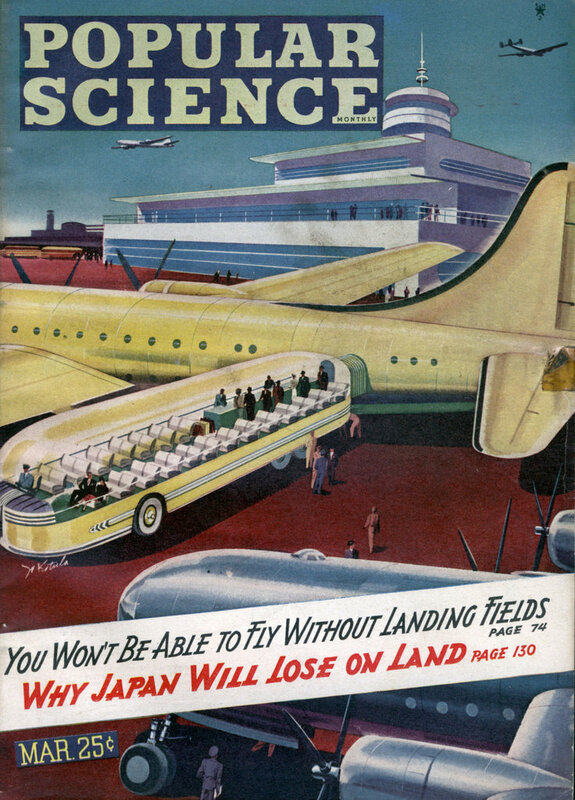 Therefore, Bell Laboratories serve the American Public. Could you get a better job with BETTER HEARING? Do you dread those important meetings that could help your business progress? Do you sometimes get in “hot water” just because you misunderstood someone? Even a slight hearing impairment may be holding you back in your job. At least find out how modern science can help you. 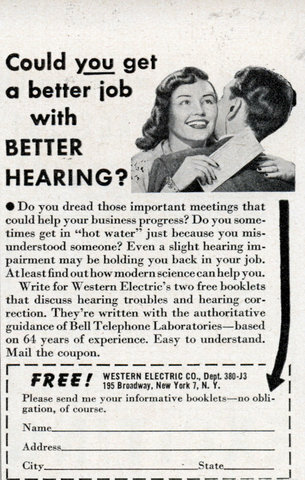 Write for Western Electric’s two free booklets that discuss hearing troubles and hearing correction. 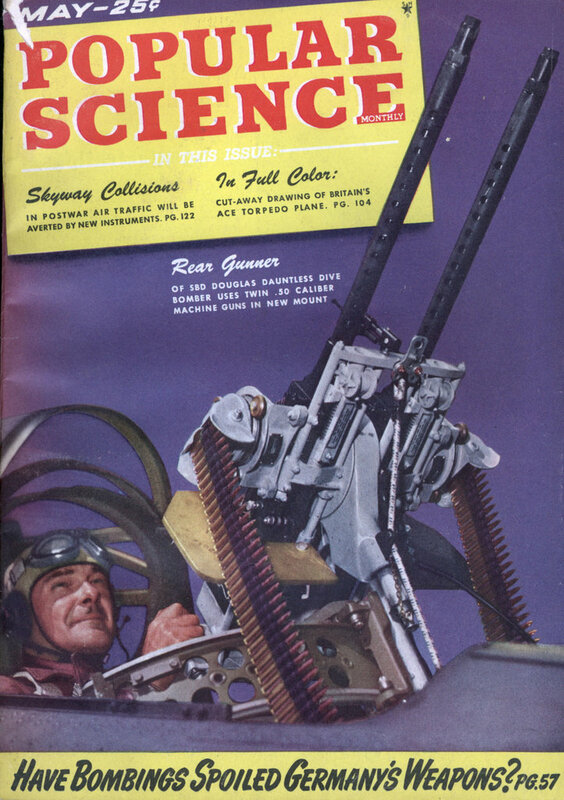 They’re written with the authoritative guidance of Bell Telephone Laboratoriesâ€”based on 64 years of experience. Easy to understand. Mail the coupon. 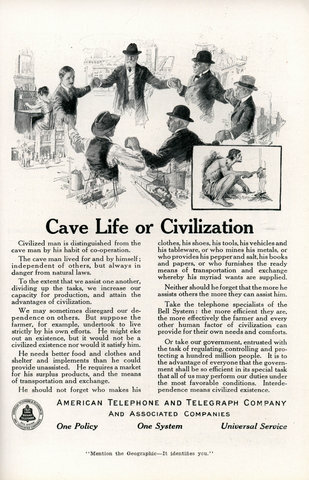 WESTERN ELECTRIC CO., DepL 380-J3 195 Broadway, New York 7, N. Y.
Civilized man is distinguished from the cave man by his habit of co-operation. 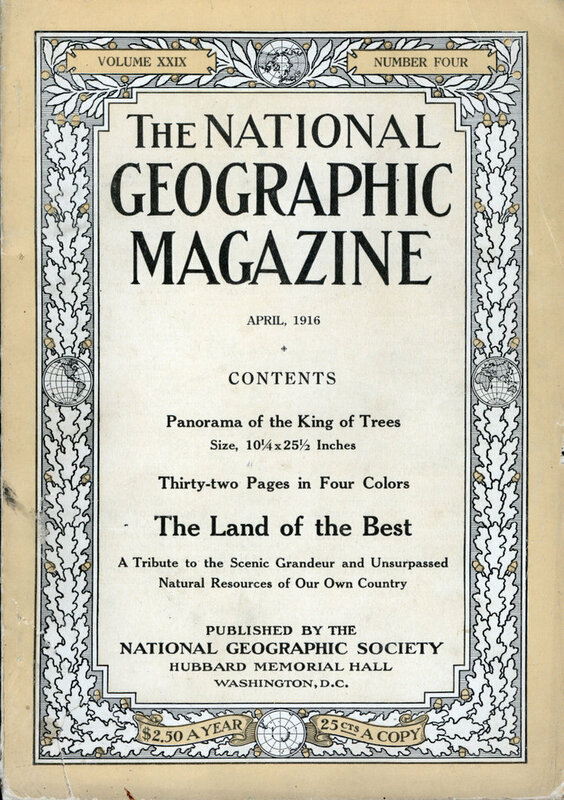 The cave man lived for and by himself; independent of others, but always in danger from natural laws. To the extent that we assist one another, dividing up the tasks, we increase our capacity for production, and attain the advantages of civilization. We may sometimes disregard our dependence on others. But suppose the farmer, for example, undertook to live strictly by his own efforts. He might eke out an existence, but it would not be a civilized existence nor would it satisfy him. He needs better food and clothes and shelter and implements than he could provide unassisted. He requires a market for his surplus products, and the means of transportation and exchange. 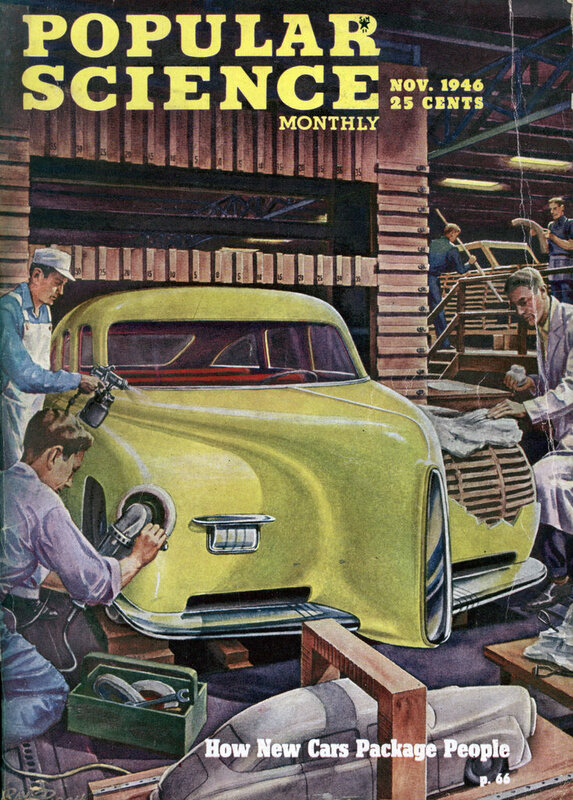 He should not forget who makes his clothes, his shoes, his tools, his vehicles and his tableware, or who mines his metals, or who provides his pepper and salt, his books and papers, or who furnishes the ready means of transportation and exchange whereby his myriad wants are supplied. Neither should he forget that the more he assists others the more they can assist him. Take the telephone specialists of the Bell System: the more efficient they are, the more effectively the farmer and every other human factor of civilization can provide for their own needs and comforts. 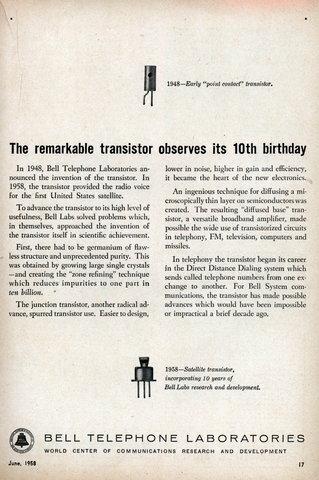 In 1948, Bell Telephone Laboratories announced the invention of the transistor. 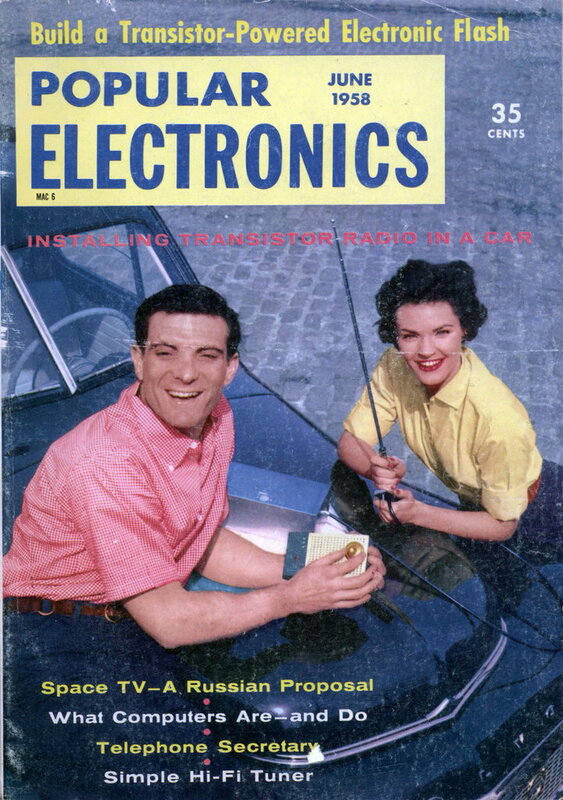 In 1958, the transistor provided the radio voice for the first United States satellite. 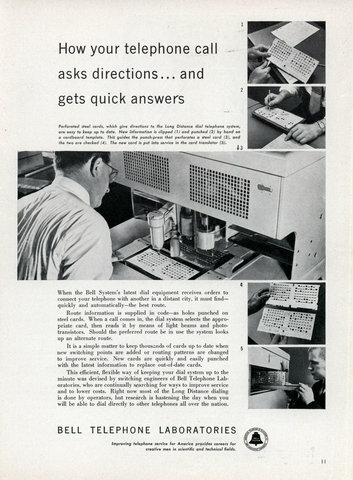 To advance the transistor to its high level of usefulness, Bell Labs solved problems which, in themselves, approached the invention of the transistor itself in scientific achievement. First, there had to be germanium of flawless structure and unprecedented purity. 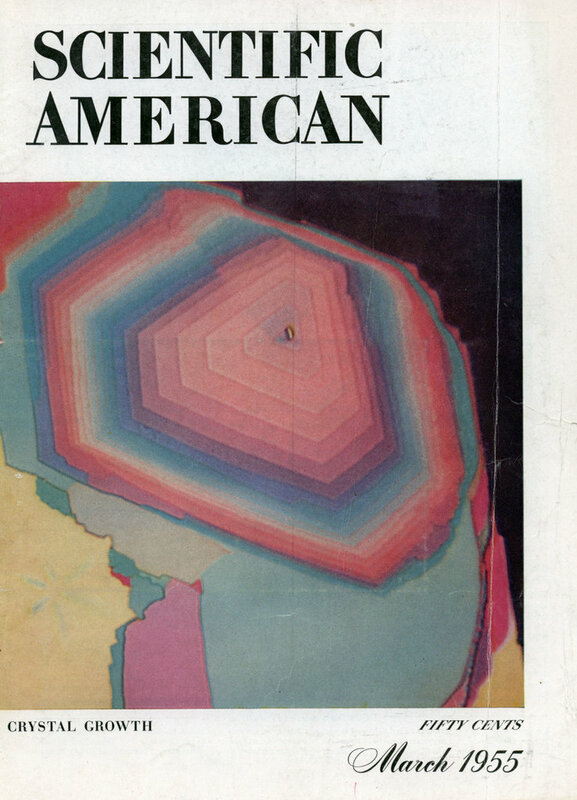 This was obtained by growing large single crystals â€”and creating the “zone refining” technique which reduces impurities to one part in ten billion. 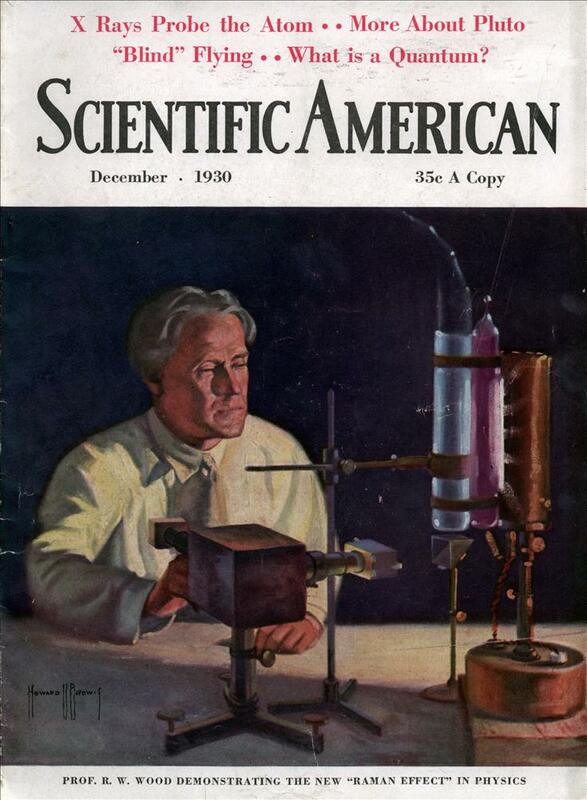 The junction transistor, another radical advance, spurred transistor use. Easier to design, lower in noise, higher in gain and efficiency, it became the heart of the new electronics. An ingenious technique for diffusing a microscopically thin layer on semiconductors was created. The resulting “diffused base” transistor, a versatile broadband amplifier, made possible the wide use of transistorized circuits in telephony, FM, television, computers and missiles. 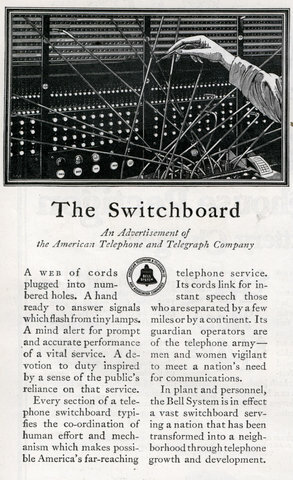 In telephony the transistor began its career in the Direct Distance Dialing system which sends called telephone numbers from one exchange to another. 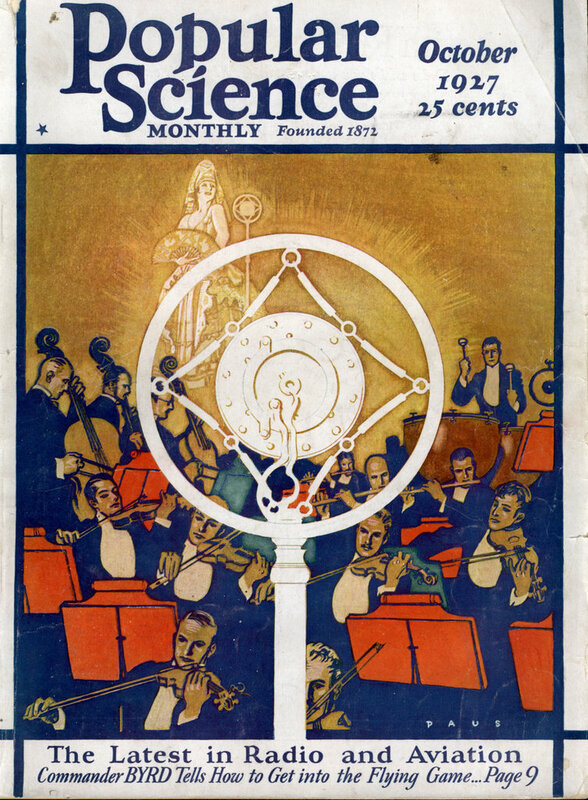 For Bell System communications, the transistor has made possible advances which would have been impossible or impractical a brief decade ago. 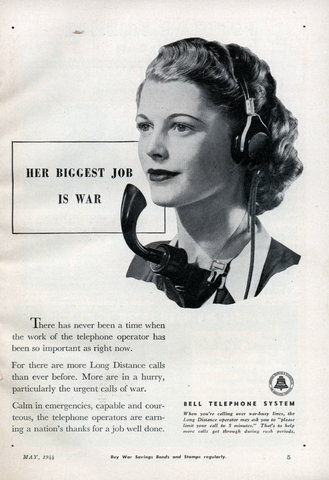 There has never been a time when the work of the telephone operator has been so important as right now. For there are more Long Distance calls than ever before. More are in a hurry, particularly the urgent calls of war. Calm in emergencies, capable and courteous, the telephone operators are earning a nation’s thanks for a job well done. When you’re calling over war-busy lines, the Long Distance operator may ask you to “please limit your call to 5 minutes.” That’s to help more calls get through during rush periods. A web of cords plugged into numbered holes. A hand ready to answer signals which flash from tiny lamps. A mind alert for prompt and accurate performance of a vital service. A devotion to duty inspired by a sense of the public’s reliance on that service. After Bell Laboratories engineers have designed a new talking circuit, they measure its characteristics by oscilloscopes and meters. But a talker and a listener are part of every telephone call, and to satisfy them is the primary Bell System aim. 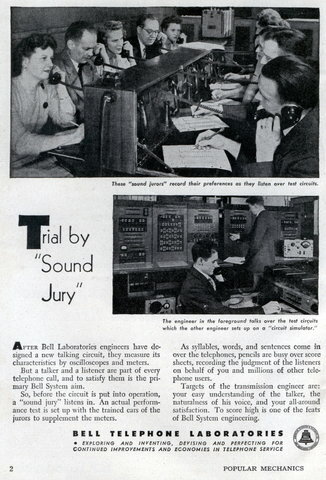 So, before the circuit is put into operation, a “sound jury” listens in. An actual performance test is set up with the trained ears of the jurors to supplement the meters. As syllables, words, and sentences come in over the telephones, pencils are busy over score sheets, recording the judgment of the listeners on behalf of you and millions of other telephone users. Targets of the transmission engineer are: your easy understanding of the talker, the naturalness of his voice, and your all-around satisfaction. 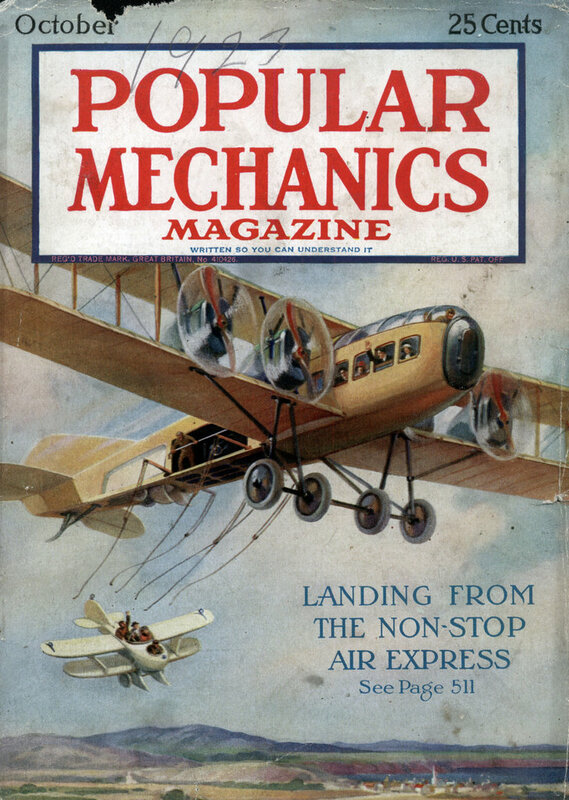 To score high is one of the feats of Bell System engineering. When the Bell System’s latest dial equipment receives orders to connect your telephone with another in a distant city, it must find-quickly and automaticallyâ€”the best route. Route information is supplied in codeâ€”as holes punched on steel cards. When a call comes in, the dial system selects the appropriate card, then reads it by means of light beams and photo-transistors. Should the preferred route be in use the system looks up an alternate route. “My thweet” lisped from the screen would mar the star’s romantic appeal. But that is something you don’t hear in the theatres which have Western Electric talking picture equipment. To reproduce the letter ‘S’ was but one of many difficulties in the way of giving you talking pictures at their best. 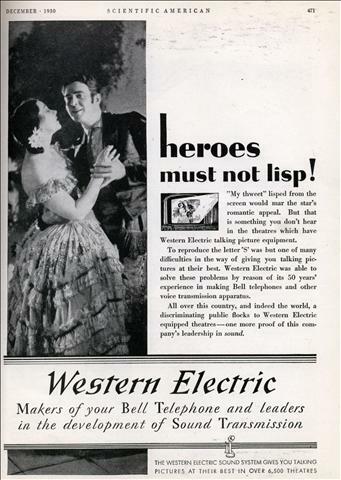 Western Electric was able to solve these problems by reason of its 50 years’ experience in making Bell telephones and other voice transmission apparatus. All over this country, and indeed the world, a discriminating public flocks to Western Electric equipped theatres â€” one more proof of this company’s leadership in sound.